The Frazier History Museum is unlike any other place in the city! Located in Louisville’s Museum Row, at 829 West Main St. 40202, this truly is the ultimate place to learn about our country’s past. 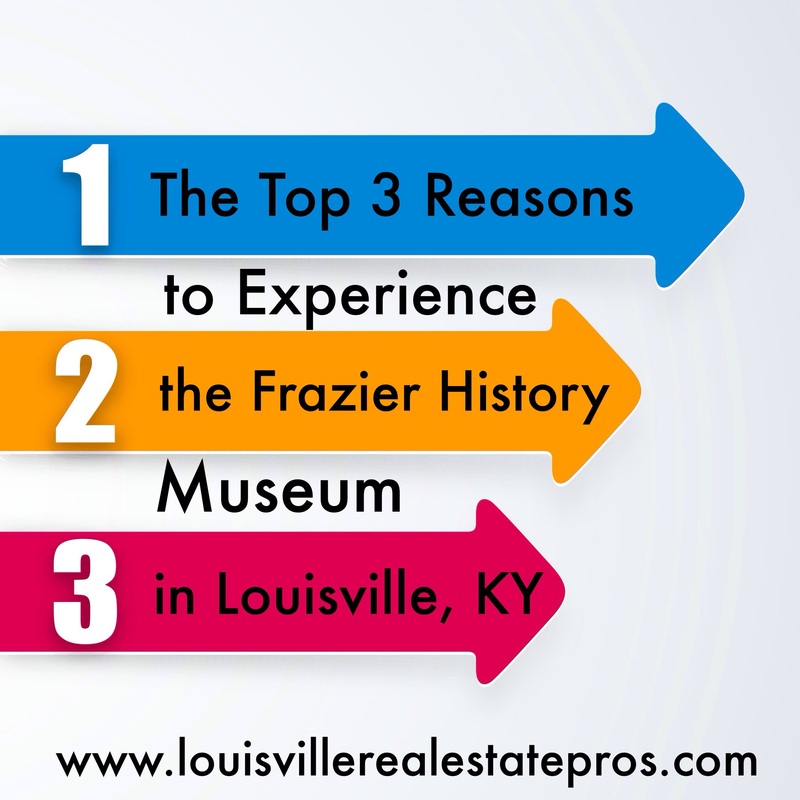 Although the motives to visit one of Louisville’s top museums are abundant, here are our personal top 3 reasons to check out The Frazier History Museum. #1. Interactive learning is perfect for the whole family. The Frazier History Museum has perfected the art of teaching about our history in a way that captivates people of all ages. A combination of preserved artifacts, life-size replicas of historical battle scenes, interactive displays, and costume interpretations provides experiences that will speak to children and adults in ways that specifically appeal to them. History buffs are always on hand to guide museum goers through various hands-on experiences as well. Hold artifact replicas in your hands to gain a better understanding of how Native Americans hunted and gathered food. Wonder what it was like to travel by horseback in the Old West? Check out a saddle and other handmade leather items while learning about our country’s historic frontier. Costumed interpreters demonstrate the art of sword fighting and teach history through storytelling as well. A visit to the museum is truly an interactive experience that charms both history enthusiasts and new learners alike. #2. Everyone is intrigued by weapons. Boasting one of the largest collections of weapons, The Frazier History Museum will amaze anyone interested in the tools behind our country’s biggest battles. From bows crafted by Native Americans for both hunting and protection, to swords of all sizes and more firearms than you can fathom, the Frazier History Collection has it all. Both American and international artifacts available for viewing will walk you down the path of America’s history from the 16th through the 20th century. The collection is truly amazing. Follow the evolution of weaponry as you walk through the museum’s numerous galleries and hallways. It’s pretty interesting to see how the armor and protection used has transformed as the weapons have changed as well! #3. The Lewis and Clark Experience is awesome! That pretty much sums it up. It’s awesome. On exhibit now through May 2016, The Lewis and Clark Experience is highly interactive and great for the whole family. Join the expedition and adventure to the American northwest. Exhibit goers learn about the various challenges faced on this historic voyage. Through this hands-on experience, you will learn about how Lewis and Clark traveled and hunted as well as have the chance to check out artifacts and replicas of their boats and shelters. It’s unique and exciting, and you will leave with a clear understanding of this important piece of American history! And there you have it! If you can’t tell, we really love The Frazier History Museum. With so many awesome artifacts to see and learn about, it’s easy to experience something new every time you visit. It’s just another reason to fall in love with Louisville, KY.
Planning to sell your home in downtown Louisville, KY? We can market your home’s beauty as well as emphasize all of the wonderful places our city has to offer! Contact Pam Ruckriegel with The Louisville Real Estate Pros at Keller Williams Realty Louisville East. 502-435-5524.